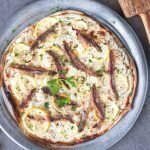 Anchovies pizza two ways. Plus a list of most compatible pizza toppings so you can fashion your own favorite version. And suggestions for beer styles to pair with it. Cured anchovies on pizza is an old secret when it comes to boosting flavor. But if you are an anchovies lover like me simply adding a couple to the pizza toppings or working them into the sauce is not enough. Sometimes you just want to indulge and let them be the star ingredient. 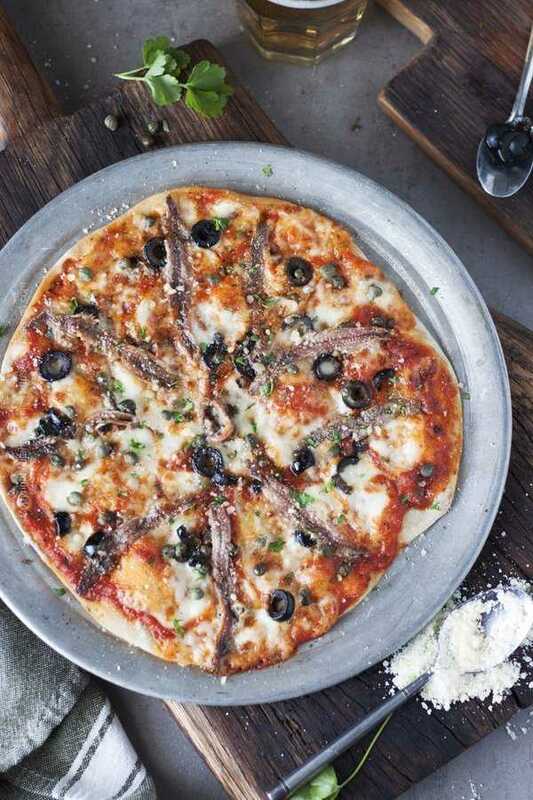 I have two favorite anchovy pizza recipes that do just that! Anchovies are little marine forage fish often prepared as small fry. However, their culinary merits go far beyond the status of exceptional beer snacks. In the Mediterranean tradition they are commonly cleaned, filleted, cured with salt and then packed in olive oil or water and canned. Through the curing process the anchovy fillets get transformed into a potent, much coveted source of deep and not at all fishy flavor. Cured anchovy fillets packed in olive oil. The fillets or anchovy paste made from them are frequently added to salad dressings, sauces (including for pasta), dips, spreads, tapenades, compound butters, marinades. the exquisite flavor cured anchovies impart is a combination of rich umami taste coupled with briny saltiness. They are very versatile and elevate numerous dishes where the contribution of umami is desired. My first version is inspired by a thin crust pizza I once enjoyed on Rab island in Croatia and have been obsessed with ever since. The second version is more of a classic pizza recipe, a la pizza Napoletana even though it does not comply with the strict rules for making its namesake. By way of pizza dough – use your favorite pizza crust recipe, or this no rise one. Alternatively, grab dough from your local pizzeria or use store-bought dough. Even flatbread topped with these ingredient combos will be delicious. 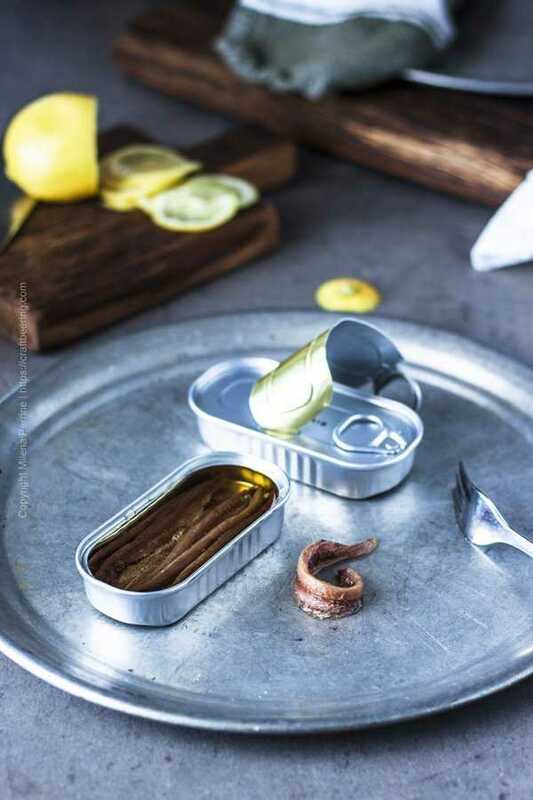 Ingredients: You will need a tin of cured anchovies in olive oil, lemon, sour cream (or creme fraiche), onion, freshly ground pepper and parsley as garnish. For obvious reasons skip the salt. 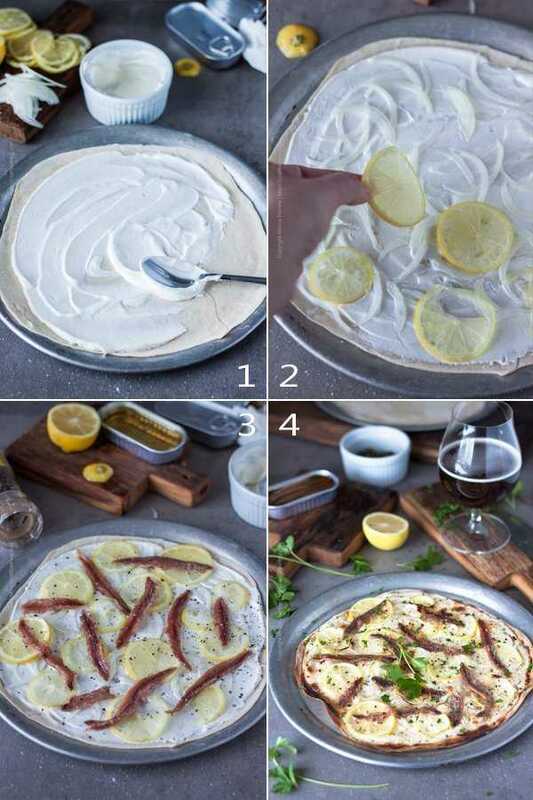 Mozzarella cheese is not needed here, the sour cream is just perfect against the caramelized lemon slices, mellowed onions and the anchovies, but if you want to add a little bit go for it. 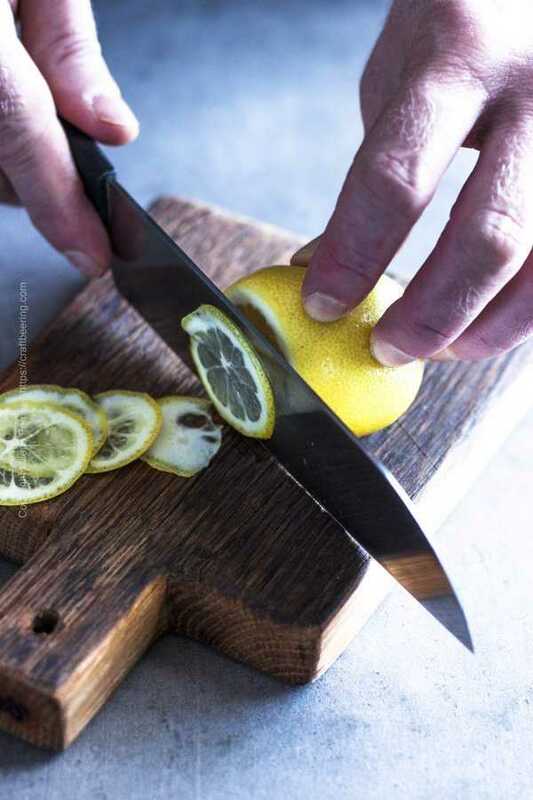 Here is how to make it: Slice the lemons super thin. As thin as possible – use a mandoline slicer if necessary. TIP: If you are a fan of preserved lemons, they can boost the flavors of this pizza significantly. 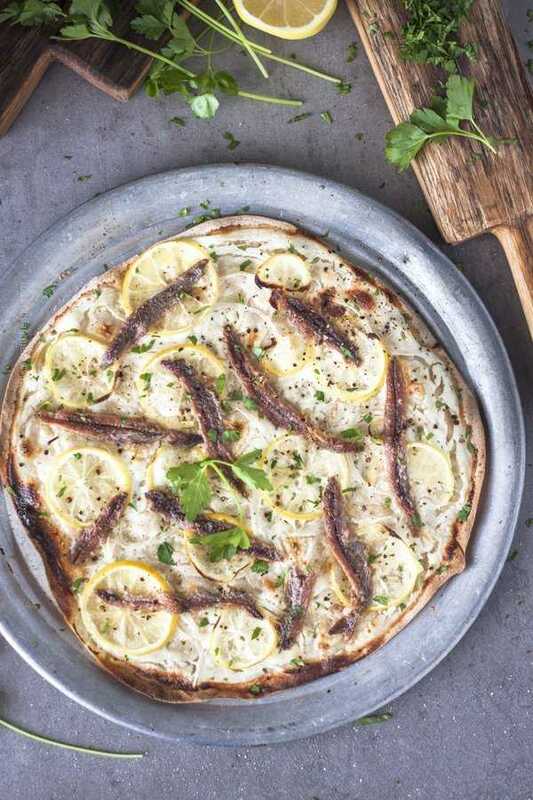 Then roll out your pizza dough (thin works better for this recipe), spread sour cream, lay down thinly sliced onions, arrange the lemon circles and scatter whole anchovy fillets (as many as you’d like). Bake in a 425 F oven and garnish with finely chopped parsley right before enjoying. Ingredients: Both marinara and fresh mozzarella join the cast of ingredients in this Napoletana inspired version. Supporting acts for the anchovies are capers and olive. Once again, parsley is a great fresh herb to garnish the pizza with, but if you prefer the more traditional basil use it. How to make it: Use your favorite marinara sauce, homemade if you have a good recipe, and apply a generous amount. Then place fresh mozzarella pieces, capers, your favorite olives and the anchovies. Bake in a 425 F oven and enjoy with a bit of grated Parmesan on top. 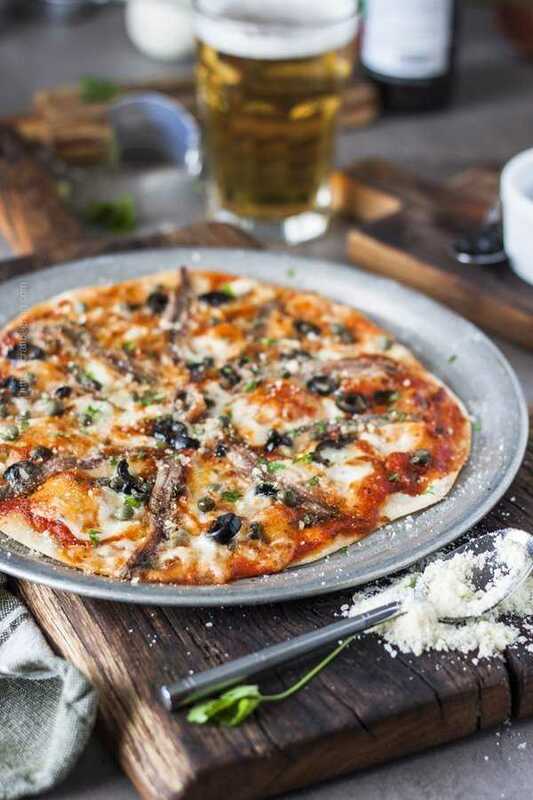 For more ingredients that go well with anchovies as far as pizza toppings are concerned see the section under the recipe card. 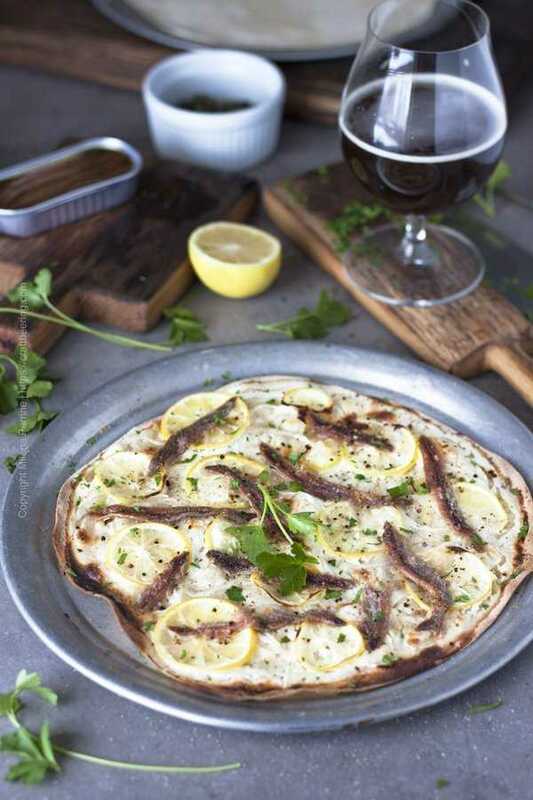 Two delicious ways to indulge in anchovy pizza where anchovies are the star topping, not simply a supporting act. The quantities in this recipe are for four 10 inch individual pizzas. Heat the oven to 425 F. Bring the dough to room temperature if it was refrigerated. Prepare pizza pans. Divide the dough in 4 equal parts, roll out thin to make about 10 inch individual pizzas. Spread 2 tbsp of sour cream onto each crust. Scatter thinly sliced onions, arrange the thinly sliced lemon circles on top and finally scatter the anchovy fillets. Season with black pepper. Bake for about 10 minutes or until the edges of the thin crust are crisp and nicely browned and the lemon slices just begin to caramelize. Garnish with parsley. Spread 2 tbsp of marinara onto each crust. Scatter pieces of fresh mozzarella, olive slices and capers. Arrange the anchovy fillets. Bake each pizza for about 10 minutes or until the edges of the crust begin to brown and become crisp. Garnish with parsley and grated Parmesan. *Use your favorite pizza dough or this recipe. Budget about 4-5 oz of dough per individual 10 inch pizza if thinly rolled. We recommend thin crust, but if you'd like a thicker crust, budget for more pizza dough weight-wise so that it will stretch out to 10 inches with a greater thickness. NOTE: Pizza dough weighs differently based on density. **This is based on 2 oz tins as typical weight. You may want to use all the fillets to top a single pizza or a bit less, depending on your taste preferences. As already indicated above, onions, lemon, capers, olives, fresh parsley or basil, marinara or sour cream all go well with cured anchovies. 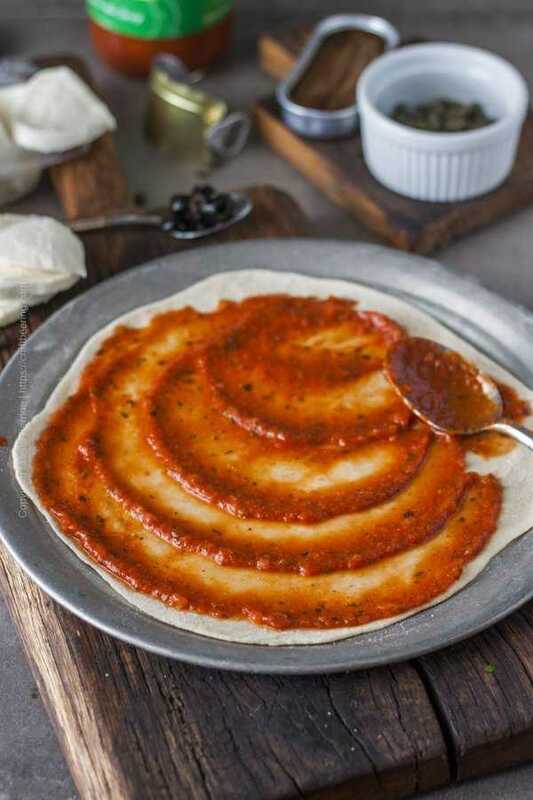 Tomato sauce – if you are fearful about adding whole cured anchovies on top of your pizza but want to experience their taste – add a couple of fillets to your tomato sauce, blitz them with your hand blender and use the even tastier sauce. Ricotta cheese – the neutrality of fresh ricotta is the perfect backdrop for the salty, umami anchovies. Roasted red peppers – their sweetness and unique flavor embrace the contribution of cured anchovies. Garlic – grate a clove or two and mix it with the anchovies to make a paste. Then spread onto your pizza crust, top with marinara or sour cream and maybe some mozzarella. Chicken – bland cooked chicken breast will instantly get a boost of flavor from the anchovies – scatter both over your pizza. Alternatively, you can brown ground chicken in a pan along with several anchovy fillets (smash them with a spoon and incorporate them in the ground meat as you stir it while browning). The saltiness of the little flavor bombs makes them a perfect partner for beer. From steak Caesar salads, through anchovies and capers compound butter over grilled fish or chicken, to anchovy pizza. Anchovies and beer have a natural affinity for each other. Look for crisp, highly carbonated pale lagers such as German pilsners – the stiff, hoppy bite of the Northern variety is my favorite, but other more balanced alternatives pair well too. Among the ales look for – saisons and Belgian blonde ales, Belgian wits, American wheat ales, Gose, Berliner Weisse, citrusy IPAs and pale ales and even hoppy reds. Why do people like anchovies on pizza so much? Or hate them so much? During my college years a roommate worked a couple of hours a night at a local pizza place for extra cash. On the menu were several pizzas with anchovies as a topping. Whenever someone forgot to specify that they would like to have the anchovies excluded from the toppings some serious problems appeared… They wouldn’t touch the pizza, as if it was so hard to simply remove the anchovies. Frequently, the pizza place would just remake the pizza to please the customer and the pie with the anchovies on it ended up with the employees… who often didn’t care for it. But my roommate did, and so did I. We had many impromptu late night ‘study’ sessions with a slice of delicious anchovy pizza in one hand and a beer in the other in result. Never appreciated the communal microwave of the dorm more! And now in retrospect – the fact that drinking beer is not frowned upon at barely eighteen in Bulgaria. Good times! 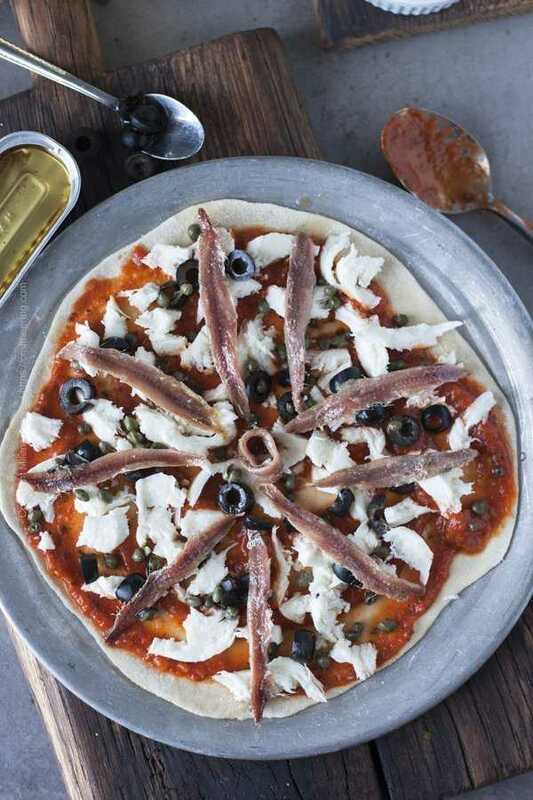 In Italy Pizza with anchovies is a classic. Even here, love it or hate it 🙂 . I’ve started to like it recently and it is really a great flavor booster for pizza or pasta sauces. Both your pizza look fantastic. A few slices of each, and a cold beer and I’m a happy camper! I identify with that statement – more anchovies always sounds better:) Thank you, Jennifer! My husband would love both of these! And we happen to have anchovies in the pantry! I think I need to surprise him! 😉 Thanks for sharing!! Sounds like you have a true anchovy lover in your life:) Thank you, Annie! We definitely see eye to eye! Yes to anchovies! I walls thought I was weird for liking anchovies on pizza so I’m glad I’m not the only one! This sounds so yummy, especially paired with something cold to drink. I’ll have to try it soon! Lol, right? People who don’t like anchovies cannot relate, but on the opposite side the obsession is real:) And so delicious! I do really enjoy the pungency of anchovies and we regularly enjoy canned fish at home. Mostly, we would use anchovies to infuse sauces or dressings. I only tried anchovies on pizza once and this totally reminds me that I have to try again…looks super good!! Love the pairing with lemon…must really brighten things! Pinned! Thank you so much, Dawn! Yes, totally – the lemony version is a winner!